Post updated, with additional information and corrections, 14 February 2011, and 13-14 February 2016. On 15 July this year, Peter McCurdy, a resident of Waterview at the end of Cowley Street (and living in direct line of the northern entry/exit point for the Waterview tunnel for State Highway 20) made a submission to the Auckland City Council Joint RCA and Transport Committee. 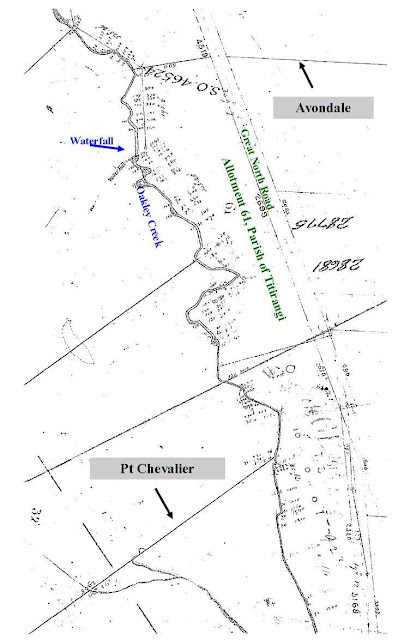 His submission was to do with historical findings as to the land usage history of the northern bend and mouth of Oakley Creek, on behalf of a new group called Star Mills Preservation Group. 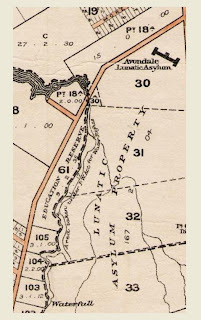 "... Edwin Oakley -- engineer, entrepreneur and violinist -- had a dam, a water-wheel and a mill on the Creek named after him. That is, by 1845." The submission seems to imply that Oakley's mill was on the Star Mill site: "there was a working mill here some fifteen years earlier." From SO 833, c. 1850s, LINZ records, crown copyright. Oakley was definitely involved with flax dressing at that point -- with a partner. We are glad to perceive that flax dressing is beginning to attract the attention of the people since the date of our last paper we have seen various samples of fine flax. Mr. Wright has by means of steam prepared some very fine samples. But we are led to think, from various experiments, that steam is not adapted for the first process; it certainly assists much in bleaching the flax when prepared by a first process, but the effect of steam upon the green leaf is certainly to harden it. Steaming may with great advantage be used as a secondary process, but the most efficient plan is boiling in potash. We were pleased to see a simple, but efficient machine in active operation at Mr. Smithson's. It is the invention of Mr. Smithson and Mr. Oakly; and is merely an improvement upon the plan in use by the natives. 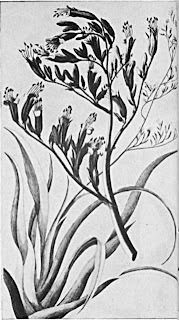 The flax is in the first instance boiled in a solution made from potash, or wood-ashes, and then passed through a scraper worked by the foot. Even with this simple machine, one man could dress from fifty to seventy pounds a day. Several improvements will, we doubt not, be made in the application of machinery. We ourselves would be very happy to show any of the mechanics the principles of machinery whereby any quantity of flax may be dressed. 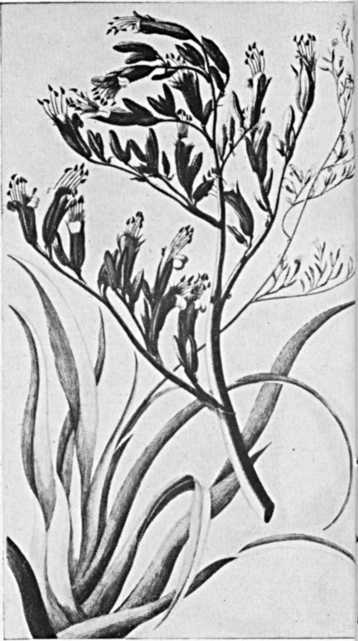 By this plan, the flax after being boiled in potashes, would be afterwards subjected to a beater; then passed through two wheels with hackles on their circumference, thereby the flax would be separated into small fibres; and finally subjected to the action of a scotching machine. A process of this kind, would certainly, and effectually dress any quantity of flax. Since the above was written, we are happy to say, that Mr. Smithson is successfully engaged in dressing flax. He is about adapting effective machinery to the after process of cleaning and from his ingenuity and perseverance we have no doubt of his success. FLAX-DRESSING MACHINES. THE Undersigned is willing to contract for the Erection of Mills and Machinery for Dressing Flax in any quantity, not less than one ton per week, and will guarantee the quality suitable for the English market. E Oakley. Wyndham-street, April 5, 1844. But, did this piano-forte salesman from 1843 actually build a mill on the steep slopes of Allotment 61? As I said earlier, the Blue Books indicate otherwise, and I could find no newspaper references to its operation (and believe me, the newspapers were very interested in ideas and developments when it came to the flax industry back then.) But, the records remaining from his three petitions in 1844 and 1845 indicate that he had a mill of some sort, a water wheel, and a number of ineffective dams which were washed away in floods before he could use them. 44/1037 3.5.44 Edwin Oakley Petition for Squatting License and to Purchase Iron to erect a Flax Mill. That your Petitioner from want of capital is unable to purchase the large quantities of land, wood and flax which would be required for the carrying on an establishment of this nature and feeling convinced that your Excellency would look favourably on an effort to bring into use an article on which the future prosperity of this Country so much depends has been induced to apply to your Excellency for your aid. D Sinclair – Inform the Petitioner that Squatting (Occupational Licenses) can only be granted from year to year – that such a License I will readily grant him if the Surveyor General approves … a suitable situation. Refer him and these papers to the Surveyor General. That your Petitioner had an occupational License granted to him by your Excellency of about three acres of land situate near Auckland about twelve months ago – That since that time your Petitioner has at considerable expense erected a water wheel and prepared machinery for the dressing of flax. That your Petitioner has also formed a mill dam but that a sufficient power cannot be obtained without incurring the risk of great loss of property, the dam having already been carried away by a Flood – That Petitioner is anxious to unite a Flour Mill to the wheel already erected and for the purpose of propelling the water it will be necessary to have a still increase power – That on Government Reserve No. 61 in the Parish of Titirangi a little higher up than the present wheel is a good Fall of Water sufficient for the purposes aforesaid – That Petitioner proposes to cut a Mill Race from the Upper Water Fall on the said Reserve 61 to the Water Wheel above mentioned and for the purpose of a flour mill. There is no objection to the Petitioner’s obtaining a squatting license of No. 61 under the Act. I visited his works on Saturday the 28th inst and found that he had been at much trouble in erecting dams across the stream, which are, I find, quite useless for the purpose he requires. The Water Fall to which he alludes and from which a race can be cut is the best water power within 15 miles of Auckland. From Archives New Zealand, documents photographed by John Adam. The Northern War came along in 1844/1845, causing anxiety in early Auckland. Oakley's scheme may have come adrift at that point. Indeed, in October 1845 and on into 1846, Auckland farmers lamented that there was no other flour mill, other than those at Epsom and Mechanic's Bay. (Letter from "A Farmer", New Zealander, 2 August 1845). In January 1850, Oakley sailed to California, then was in Hawaii for a time, returning to Auckland later that decade to take up another partnership, this time with carpenter/builder John C Jearrad at a Mechanics Bay sawmill. He arrived back in Auckland from Sydney on the barque Breadalbane in early October 1858. (New Zealander 6 October 1858, p. 2) In 1859 Oakley took it over (Southern Cross 11 March 1859) but it is unknown how long he remained involved there. The term "entrepreneur" suits him well -- trouble was, his ideas never seemed to stay the distance. In 1861, he was one of a number writing reports as requested by the Provincial Council as to Auckland's water needs and future supply. Tellingly, he did not refer to the creek that seems to bear his name as an option (perhaps because it had cost him so dearly?) By 1862, he was living in Mongonui, arguing over timber rights (Southern Cross, 5 September 1862), was an unsuccessful tenderer for the construction of an iron store at Queen Street wharf in 1864 (Southern Cross, 29 September 1864), he was successful in his tender (and contract) to build a store at Port Waikato for the Government by July 14, 1864 (Return of Contracts, December 1864, AJHR 1865, Session I, D-07), and ran for both the General Assembly and Provincial Council for Mongonui -- although he lived at Port Waikato -- in 1865. TO THE FREE AND INDEPENDENT ELECTORS OF THE DISTRICT OF MONGONUI. GENTLEMEN,— You will soon he called upon o exercise the privileges conferred by the Constitution in the election of a Representative of your interests in the General Assembly, and also in the Provincial Council. Having been solicited to accept both these nomi nations, I have consented to the proposal; and, if necessary, demand a poll. Should you elect me as your Representative, I shall strenuously urge the facility of access and great security of your splendid harbour, the salubrity of your climate and fertility of the soil, which, I believe, only requires some modification in the existing land laws (holding every facility to those who are willing to reside on the land and cultivate it) to cause an immediate and large increase to your population and to the Electoral Roll, sufficiently preponderating over any obstacles that can be raised by the Southern portion of the colony to prevent reparation, followed by effective and economical Government for the North, in which I intend being a permanent resident. I remain, Yours faithfully, EDWIN OAKLEY. At that point, I lost sight of him in Papers Past. However (update: 13 February 2016), he appeared in the electoral rolls at Port Waikato up to around 1869, then in the 1870-71 roll he was on a leasehold property at the Horeke Saw Mill up in the Hokianga. He may have been in Hawaii as early as 1877, operating a building firm from out of the International Hotel in Honolulu. (Hawaiian Gazette, 28 February) Certainly, by 11 August 1881, he was resident in the island kingdom, taking out a lease for land on Queen Street, Honolulu. (Hawaiian Gazette, 9 March 1886, p. 2). His business career began to come undone in 1885, his fate tied to a contract he undertook for the royal government. There was a dispute over part of the bill, he refused to reduce it, so Paul Neumann, Attorney General for the royal court, refused to pay, and Oakley's creditors demanded their due. There were even claims of demands for a "backhander" payment to process the bill at the royal court. Yesterday morning about half past nine o'clock Edwin Oakley was found dead by the side of Kewalo street, on the plains. The body was in a sitting posture, the throat cut and the blood vessels of the arm severed. A razor was found near the corpse. W C Wilder, Jr, the first to make the ghastly discovery, notified the Station House authorities, and Deputy-Marshall Dayton, as coroner, held an inquest, the jury returning a verdict that he died by his own hand. At thirty years of age the deceased went to South Australia, thence shortly after emigrating to California, where he lived for a long period. While there he was leader of an orchestra, and the inventor of improvements in piano frames and violin rests. He has been in these islands a good while; for seven years foreman for Mr E B Thomas, contractor. His reputation is that of a square-dealing man in all business matters. Oakley was a bachelor and had no relative in this country. He held the lease of three cottages on Queen street, living in one of them. Lately he was in hospital for some ailment that the physicians failed to diagnose. A large amount, for a poor working man, was due to him for some time at the Palace, while several of his creditors were threatening to sue him. These circumstances combined to depress him greatly, and he had been heard repeatedly to express a purpose of self-destruction. On the person of the deceased were found near fifty dollars in gold, paper and silver, a bottle containing arsenic, private papers and small personal effects. The body was interred at Makiki after the inquest. A movement was set on foot this forenoon, however, to accord decent burial to the unfortunate man. Mr Thomas circulated a subscription paper, and in a few hours secured all the money required for that purpose. Accordingly, the body has been disinterred, and the funeral will take place from the late residence of the deceased, Queen street, at ten o'clock tomorrow forenoon. The late Mr Oakley, having died intestate, his affairs revert to the British Consulate for settlement. According to the family historian, a younger brother, similarly best by financial woes in 1848, also committed suicide. The heart pierced by a sword image tend to be used in Catholic cemeteries, symbolising the Virgin Mary and the prophecy that her heart would be pierced by grief, as if by a sword. It also symbolises repentance and devotion. Or, it could simply have meant that Oakley's friends felt that he had been stabbed through the heart in the metaphorical sense. His end was a sad and untimely one, and was undoubtedly precipitated by the actions of those who could have averted his taking off if they had wished. Allotment 61 remained in Crown hands, passed to the Auckland Provincial Council as a funding reserve in the mid 1850s, leased by the Superintendent in 1874 to a man named Howard (possibly Joseph Howard, who owned the farm just across the creek at the time), and then assigned back to the Crown in 1882. This was a smaller version of the original Allotment 61. Bits seem to have been carved off it, at the Waterfall end, and initially passed to private hands, but eventually (Allotments 102-105) ending up back in the hands of the government, and were traded between education board and asylum authorities for the future Fowlds Park site in the early 1890s. So, was Edwin Oakley's flax mill at Waterview just another one of his grand ideas for profit, or did it exist in any sort of functioning state? Contemporary records so far weigh against it, but -- hopefully the group researching him and his mill will provide further clues for public viewing as to what went on alongside Oakley's Creek all those long years ago. It's such a shame you can't get a local archaeology group interested in surveying the land or running geophys over it to just get an idea either way, let alone get them to start digging. Even though the waterfall would have provided the power surely there would have needed to have been some alterations to the shoreline and a wheel pit excavated for the waterwheel to run in - and newspapers would have made mention of any difficulties at the site with both the flax mill erection and any further buildings having to fill in the wheel pit, etc. The thing is -- that site has already had archaeologists crawling all over it. Mainly, all they found were middens, possibly late 19th century stuff (paddock fence enclosures) and 20th century drainage and rubbish remains. Thank you so much for writing about this. I am strongly drawn to Te Auaunga and have wondered about it's European namesake. 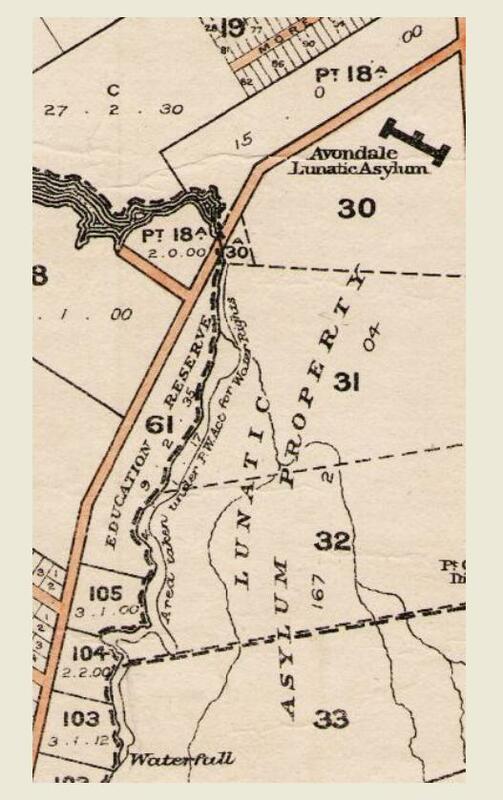 My insane (long dead) grandfather was kept at the asylum a number of times and I sometimes wonder at the ghosts that might wander around the creek. To think that poor Edwin might even be among them, I felt really sad to read that he had committed suicide. I also find it strange that more isn't done to dig around - I absolutely love retrieving old bottles that are revealed by the lastest wash of rain or flooding. Candice.